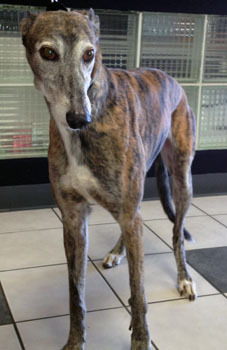 Kate, aka DLT Whistle Bye, is a beautiful, 10-year-old brindle female, born April 8, 2003. Her sire is Craigie Whistler, making her grand sire Molotov, and her dam is Floridian, making her grand sire Black Streaker. Kate and Tom, aka DLT Whistle Time, are littermates. Kate has 12 races logged for her career, starting January 1, 2005 in Corpus Christi and finishing there April 3, 2005. One glance shows Kate to have that "Molotov look" with the white throat and chest. She is one gorgeous girl. Kate was in a home for over seven years, but has since returned to GALT due to a change in family circumstances and no fault of her own. Kate is cat tolerant. More pictures coming soon.